If your job is anything like ours, taking a vacation can be stressful. Time away from work means things have to get done earlier, people covering for you need to know what they’ll be handling, and any necessary details or contact information have to be shared in advance. Being away is nothing like a formal handover. It’s more like, “by the way, while I’m out…” But how do you know that the other person or people have all the information they need? Phone numbers and email addresses get scribbled on scrap pieces of paper and then promptly forgotten. Task details are shared and someone just says, “yes, sure” and ends up dropping the ball. 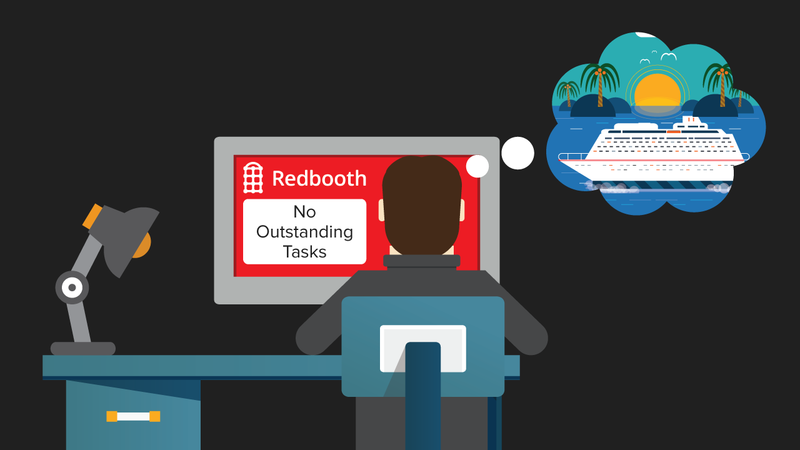 When you have work to delegate to others while you’re away, a shared task management system or project management platform like Redbooth can mean all the difference between projects continuing to move along smoothly or your vacation being a bottleneck. When delegating, we like to create a task within the appropriate project and assign it to the person who will be executing. If it requires the input from other people we are collaborating with, we like to include those people in the “notify” list. We’ll also tag them in a a comment saying something like, “Hey Brendan & Alex, while I’m out, Josh will take over the research on this component of the report.” This means that everyone who needs to be informed will know when you’ll be out and who is taking over in the interim. Josh can then also contact Brendan or Alex if they have any questions too. We also like to include task descriptions. This is the place to include details, contact information and resources for the person covering to refer to so they aren’t operating blind. If there are a few steps that they’ll have to take (and not forget about), adding sub-tasks works beautifully. Finally, if there are existing files associated with their work, it’s always a good idea to attach them to the task. Then no time is wasted tracking down the right document, and no one needs to start from scratch unnecessarily. If you just want the document reviewed, add that in a comment with the file. Lastly, don’t forget to make sure whomever is handling your duties has access or all the right permissions before you leave. Sayonara and have a great holiday!